Taking place in the year of our Lord 566., this Titanus production stars the incomparable Jack Palance as 'Alboin, Konig der Langobarden'. 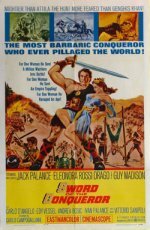 Ravaging the country during the opening credits, this barbarous war lord has his eyes set on princess Rosmunda (Eleonora Rossi Drago) and her father agrees to a marriage of convenience. This is merely so she can't be with her one true love Amalchi (Guy Madison), who has already passed every fairy tail test her daddy came up with. Instead the good king almost puts Amal into an Iron Maiden before he catches on to the Barbarian opportunity. After this I will not be mentioning any more character names, as they are far to confusing and similar sounding.